The Durban Girls’ College Choir and Orchestra circumven ted Harry Potter mania on London’s Trafalgar Square to stage a well-received concert at South Africa House in aid of the University of KwaZulu-Natal UK Trust. About 100 people attended the event on July 7, the highlight of a fortnight-long tour to the UK and Ireland. But performers and guests were unable to get into South Africa House via the main entrance because of the crush of Potter fans outside and had to find their way in through a side entrance. The girls – many of them Potter fans themselves – were given a wonderful albeit brief grandstand view of the wizardry going on on the Square from an upper window before they had to prepare for their concert. 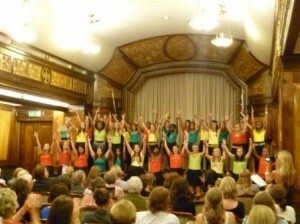 The choir and orchestra performed a varied programme over an hour, including a unique “collage” of traditional African song and dance. Some numbers required audience participation, including waving the arms and ululating, or joining in beside the piano to sing with the choir. The guests took part enthusiastically. The choir was conducted by Ronel Perks, the orchestra by Teb Brian and piano accompaniment was by Kim Siedle. Proceeds from donations to the Trust as a result of the concert are expected to run to around £500, with some donations still to come in.